In order to operate efficiently, businesses need competent employees who can carry out their jobs professionally. Having staff of high calibre has many advantages (and vice versa). To execute their jobs effectively, communication is essential. This is especially needed between staff, customers and suppliers. This also applies for staff at the top of the hierarchy to the very bottom. 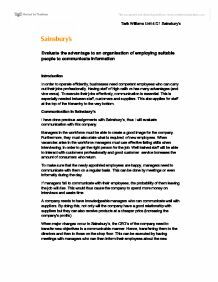 I have done previous assignments with Sainsbury’s, thus I will evaluate communication with this company. Managers in the workforce must be able to create a good image for the company. Furthermore, they must also state what is required of new employees. When vacancies arise in the workforce managers must use effective listing skills when interviewing, in order to get the right person for the job. Well trained staff will be able to interact with customers professionally and good customer service increases the amount of consumers who return. To make sure that the newly appointed employees are happy, managers need to communicate with them on a regular basis. This can be done by meetings or even informally during the day. If managers fail to communicate with their employees, the probability of them leaving the job will rise. This would thus cause the company to spend more money on interviews and waste time. A company needs to have knowledgeable managers who can communicate well with suppliers. By doing this, not only will the company have a good relationship with suppliers but they can also receive products at a cheaper price (increasing the company’s profits). If Mangers/Directors fail to pass down important information then the infrastructure of the system will be insufficient. An advantage is that email would save money and time. As risky as it may be, sending information via email is faster than having meetings and conferencing. It’s also more cost efficient due to email being completely free, though this method carry’s more problems than advantages when looking at a company like Sainsbury’s. 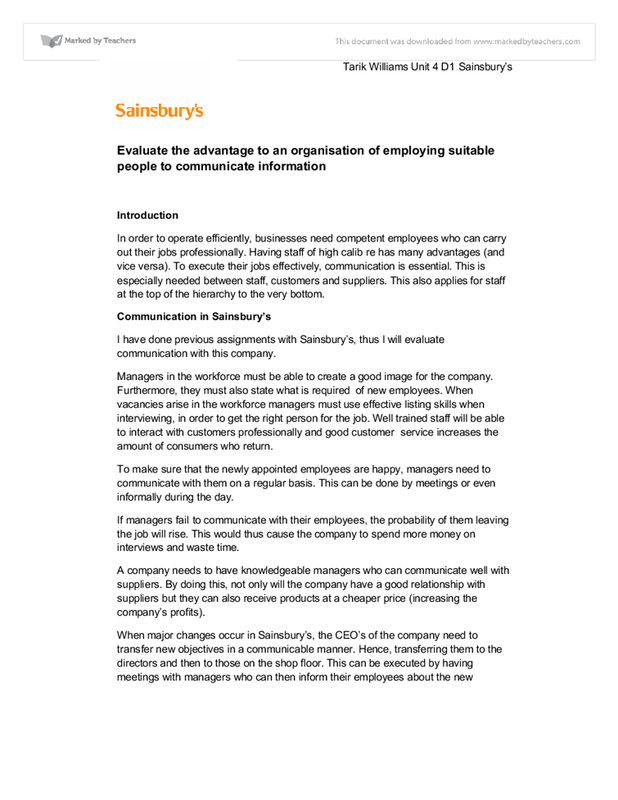 Communicating with staff efficiently would cost more money for Sainsbury’s; however this can be seen as an advantage and disadvantage. Large companies need to communicate with their staff in order to update them on business performance or the changes they’re making. In order to do this, the company would need to hold a conference for managers so they can readily pass on information to others. Thus Sainsbury’s would have to spend money for staff conferences; however this would increase profits in the long run. While Sainsbury’s may not have the most market share, they are still trying to exceed their main competitors such as Tesco and Asda. In order to do this, a company would need to invest a large amount of money on advertising and employing capable staff for the marketing department. Though like most investments, an excessive amount of money needs to be given in order to profit in the long run. The same concept applies here. Employing marketing staff of high calibre and advertising nationwide may cost a vast amount of money. However, their customers would increase and profits would improve in the future. Transferring information in business is essential and can only be done efficiently with competent staff. If a company were to employ those who are incompetent, then transferring important information would not be executed efficiently. This would thus make the business unstable. Failing to communicate with staff makes it all the more likely for them to resign and fall into the hands of the company’s competitors. Thus, losing customers and making a loss. Hence, this is the reason why communication in business is essential and why a company needs knowledgeable to staff to communicate with others effectively. This student written piece of work is one of many that can be found in our AS and A Level Marketing & Research section. Since 1980 over �500 million has been raised. Each year one evening of programming is set aside by the BBC on its flagship television channel BBC one, to show events aimed to raise money exclusively for charities working with children in the UK. For my business, I would have a few security cameras and alarms in the store, but it would be covered in the front, as it would have a large metal sheet which covers most of the businesses stores at night. if they decline the job offer, then the second best candidate will be informed and it will pass down to them. Organisation Structure of Willenhall School Staffing to meet changing business demands Suitably qualified staff may be recruited or trained within the business organisation so they have the right qualifications when they first join the business. and achievable so if in a month 200 cases of five alive are sold a month then sell 210 cases of five alive a month. This will not give Coca Cola enterprises a massive amount of profit immediately but over a year it will have an effect on profits. Apparently a lot of hedgehogs have been found dead or dying trapped in this position. This environmental issue won't really have a very big affect on McDonald's objectives although they may need to change the lid design of the McFlurry which may cost a bit more then the usual price of the lid. performing a liaison role with the Government, providing information on investment opportunities in the country, as well as investment related regulations and laws1. In its export promotion activities, the ADA helps find export markets for products, undertakes market studies and seeks out partners for joint ventures aimed at increasing the volume of exports. As you can see there is a 46,153 increase each year. This means there is as 70% change overall. 2002 2003 2004 2005 2006 % change BMW 930,221 944,072 1,059,978 1,122,308 1,179,317 5.1 BMW's current sales trend of BMW, taken directly from the BMW education website.